First of all, so many thanks to everyone for the kind comments/messages/words of glee & encouragement following our happy announcement earlier this week!! We are touched and appreciative beyond measure, and I will do a better job at responses soon! Friday was my first solo flight with Aurelia (I know I’ve been spoiled so far!). 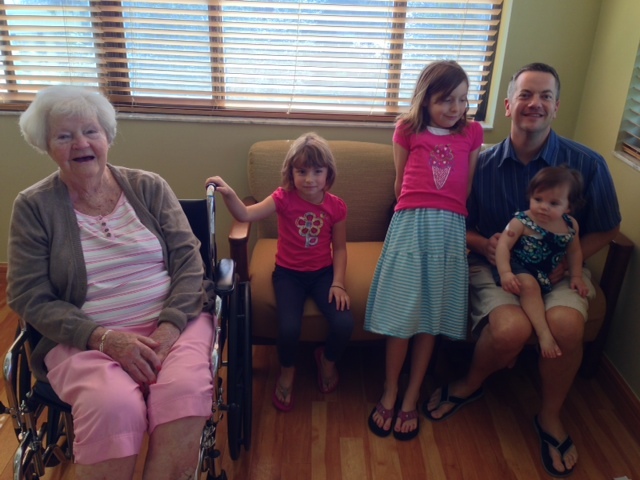 We took a direct three-hour flight to Florida to visit my soon-to-be 99-year-old grandmother–good genes, right? After this experience, John and I vowed to take a break from airline travel…and then we promptly booked tickets for trips to Florida and Minnesota (for Thanksgiving) in the same week. Oj! The flight was a mild disaster, beginning with tears and thrashing when the flight attendant first told me I had to take my happy, playing child off the ground and hold her in my lap while we sat on the runway for 20 minutes (felt longer). 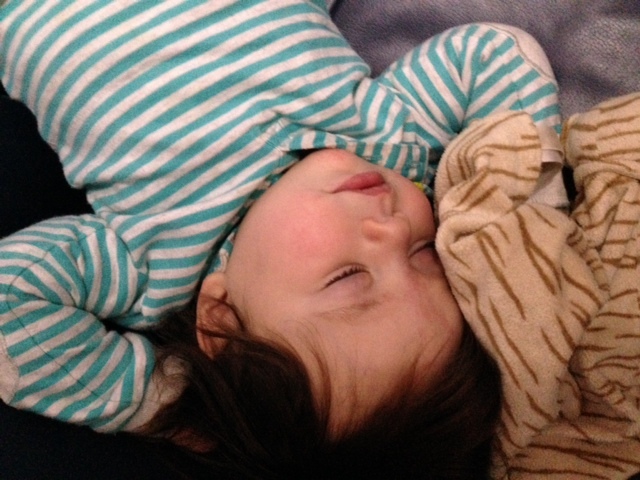 Poor little girl was fairly miserable except for the 25 minutes in which she fell asleep in the midst of thrashing (I worried she might have knocked herself out initially). 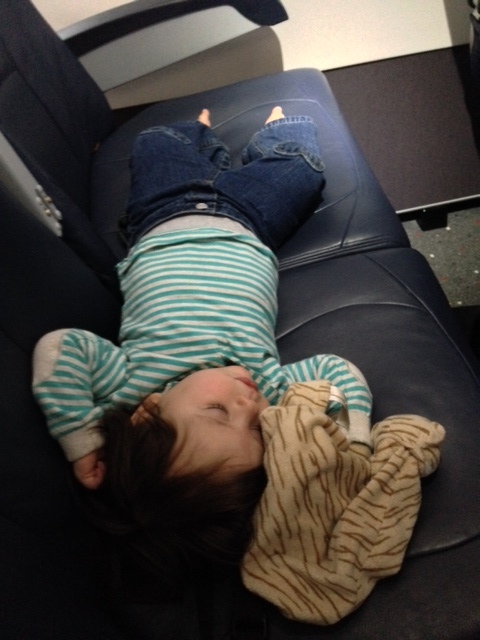 We weren’t so lucky on the trip back this morning (the flight was completely packed to the brim), but a well-timed croissant bought us a good 7-10 minutes of happiness, and she loved crawling/walking/hobbling up and down the aisles until we were reprimanded by a well-meaning flight attendant. After a rough day of travel and having just put the babe down for a killer nap, splitting a pint of Haagen Dazs a mere hour before dinner with your dear old dad is a great idea in theory only. A toddler who is too social for an airplane does great at a restaurant. Naked time = best time. The best babysitters for a toddler may be the four- and eight-year-old cousins who are happy to imitate her every move. If you’re 99 years old with vascular dementia but have still maintained your quick wit and snappy comebacks and your only laboratory abnormality is a slightly low albumin, you are a remarkable old bird. Until recently, my grandmother was only on a baby aspirin daily. She might just outlive us all. I’m absolutely delighted that you were in Florida to see Mom!! She has always been an inspiration to me, even when I was too young to realize it. Now, more than ever. And I have no doubt that the rest of the folks at Bentley enjoyed the kids too! Christine and I are glad to hear about your good news too. I’m sure you’ll master all the tasks involved with flying colors. I cannot help thinking of Gunda, and remembering how very, very much your mother loved being a mother.